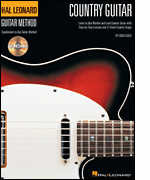 This book uses real country songs to teach you the basics of rhythm and lead country guitar in the style of Chet Atkins, James Burton, Albert Lee, Merle Travis, and many others. Lessons include: Chords, Scales and Licks - Common Progressions and Riffs - Carter Style and Travis Picking - Steel Licks, String Bending and Vibrato - Standard Notation and Tablature - and much more! Songs include: Could I Have This Dance - Green Green Grass of Home - I Fall to Pieces - Satin Sheets - Yakety Sax - Your Cheatin' Heart - and more.